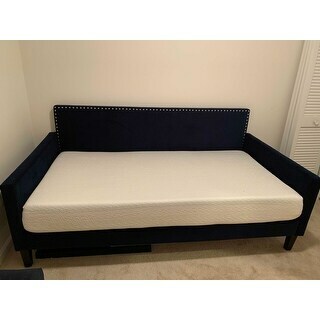 Just received it and it is awesome and it's so cool I'll let you know how my first night goes, Ok been about 15 days and I would not put it on a box spring I would try it with a platform bed frame. But I won't be able to do that until I get rid of my queen size bed. Wow sleep is so important so is comfort. Recommendations Get a platform for this. Two leading sleep technologies blend together in a marvelous marriage in this magnificent mattress. 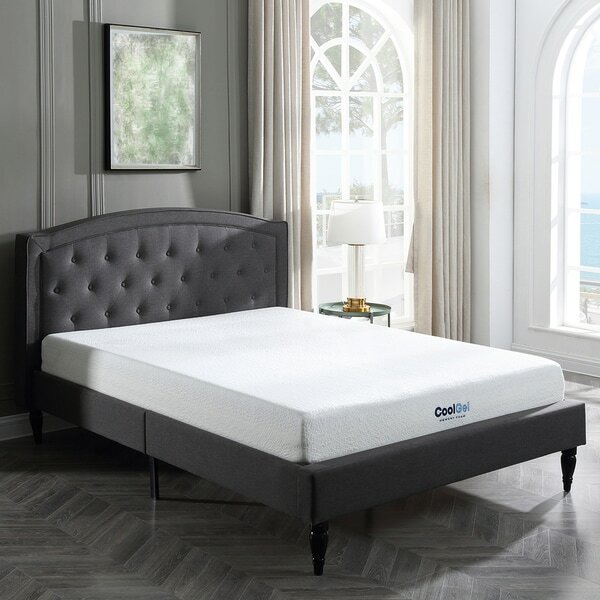 Gel-infused memory foam engulfs you in comfort through the night and body-contouring memory foam reduces pressure points and properly aligns the spine. The gel draws heat away from the body for the ultimate sleep surface in an effort to prevent tossing and turning for the most restful of repose. I have been sleeping on a 12 inch memory foam mattress for about 10 years. I love memory foam, but it wears down after a few years of good use. I bought this gel memory foam mattress for my son and I have literally traded beds with him for naps because I sleep so well on this mattress. The pressure sores do not even happen for me with this mattress. I get such a restful sleep when I sleep on this mattress. It is worth every penny of investment to buy this mattress. I prefer spending money on a new mattress like this rather than doctor bills and pain medication. This mattress arrived early. It took about 48hrs for the mattress to fully acclimate. I read some reviews about a bad odor, but I didn't notice that it was that bad. We have only slept on the mattress a few times, and found it to be way to hard for our liking. However it's been a long time since I've been able to sleep through the night without burning up. So concerning the cool gel part I would give it 5. But because the mattressis so hard, over all I have to give it a four. We will be ordering a mattress topper to help with the firmness of this mattress. My mattress came in a timely manner and i am very satisfied with the product. Would highly recommend this mattress for people that have nerve issues. My hands hardly ever go numb anymore. A Little Warmer than I had Hoped. This is a very good mattress. Just a little warmer than I had hoped. It is Great as far as the support and comfort. I'm 55 & have a bit of arthritis so I need a good mattress. I don't wake up sore and stiff like I have in the past with other mattresses, so I'd give it a 9 on a scale of 1-10. My kids love these mattresses. The just switched from springed ones to the memory foam and sleep very well on them. Just the right blend of support and softness. I had this as a new mattress for my daughter for her new bed in her updated room. Usually, the foam mattresses I have purchased in the past had strong odor, and took a long time to dissipate, but not this mattress. It took it normal shape in a day, and fit the twin be perfectly. My daughter tells me that is it comfortable, and tells me that she sleeps well at night. No complaints. Price was excellent, amazingly comfortable! I bought it for my son, but I have slept in it a few times. I bought the same mattress for myself (only queen 14" thick) and this one is actually slightly more comfortable than mine. My son is autistic and doesn't sleep very well. He sleeps a whole lot better now! Very easy to set up and slept on it in just a few hours. It is pretty firm, so you better like a firm bed but it doesn’t put pressure on your body. Oh my goodness! I was not expecting Heaven on a Twin kiddo bed. I can opt out for this mattress anytime. So cool and comfy. Easy peas just rolled it out, actually my 19 year old grandson did it for me! Now they are fighting over who is sleeping there instead of our new King Size Bed! Again this week super blown away with packaging and fast delivery and more than ever, QUALITY! Super convenient and very comfortable! Ordered for my son’s loft and and its the right depth. The gel makes it extremely comfy to sleep on. I purchased this mattress to go into a couch bed I also purchased. The mattress was rolled tight in the box. I didn’t think it would expand as well as it did. I laid out on it with no problems. It has a slight odor as it’s expanding but has disappeared over the week it’s been out. This mattress is very comfortable and exactly what my warm sleeper was looking for. After a few months it starts to sink which makes for a extremely uncomfortable sleep. I weigh 190lbs. This mattress may be great for kids/teens, but not good for adults. Great mattress but not great for a trundle, it was oversized because foam mattresses vary in size despite it being a twin. Ended up selling to a friend. We got this mattress for my daughter and love it!! This mattress weighs approximately 80 pounds. "what is the width and length of this mattress"
It measures 60 X 80 inches. "Is it like medium firm or more on the firm side?" "Does this mattress work well with adjustable frames?" Because I just got a twin bed and needed a mattress for it. "is thi good for an adult"